Prior Lake came up short against Eden Prairie but they'll get a chance at revenge this week against Minnetonka. 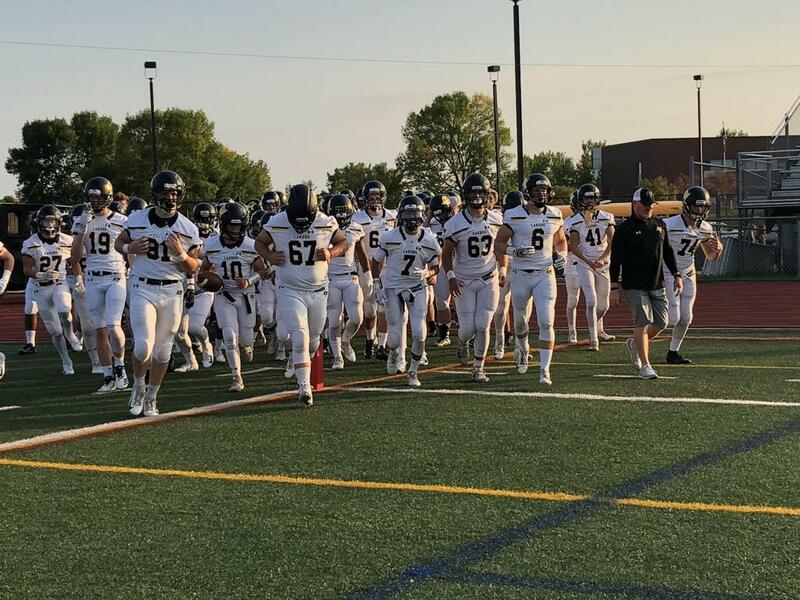 A pair of touchdowns, one just before halftime and another following an interception to start the third quarter, were backbreakers as the Prior Lake Lakers fell to the defending state champion Eden Prairie Eagles 35-12 September 14 at Eden Prairie High School. The game started out on a positive note for the Lakers as the defense forced a three-and-out and a short punt set the offense up at midfield. However, the offense was unable to pick up a first down and were forced to punt. Eden Prairie struck first on the next possession. After a long pass by quarterback Cole Kramer to wide receiver Daejon Wolfe got the ball close to midfield, the Eagles faced a third-and-4. Kramer dropped back on a play-action pass and connected with tight end Matt Sherman in stride on a crossing route who took the ball all the way into the end zone. The extra point was no good but the Eagles had a 6-0 lead near the halfway point of the first quarter. The Lakers answered right back on the following drive with a score of their own. Quarterback Nate Raddatz connected with wide receiver Parker Ellis for a pair of key third down conversions before finding running back Keaton Schroeder on a screen pass. Schroeder caught the ball and followed his blockers into the end zone for a 12-yard touchdown. The extra point was no good due to a high snap but the score was tied with 1:28 to go in the opening quarter. The Eagles converted on a key first down on the first play of the second quarter. Facing a third-and-10 from their own 20-yard line, Kramer connected with an Eden Prairie receiver on a wheel route deep down the Laker sideline for a 36-yard gain. Eden Prairie then turned to their ground game to finish off the drive as running back Sherwin Pompey Jr. rumbled in for a 12-yard score. The two-point conversion attempt was good, increasing the Eden Prairie lead to 14-6 with 9:11 left in the half. The Laker offense tried to once again tie the game up on the ensuing possession. They marched down the field behind a mix of both passes and runs getting all the way down to the 3-yard line. However, a motion penalty pushed the ball back to the 8-yard line and Raddatz threw an interception on the following play, ending the drive. After the defense forced a punt, the Prior Lake offense tried to put another drive together before halftime. The Lakers picked up one first down but were stopped short on a third down on their own 44-yard line, bringing up fourth down. Prior Lake opted to go for it but running back/linebacker Spencer Shaver was stopped short of the line to gain, turning the ball over on downs. The Eagles then marched down the field and scored when Kramer found wide receiver JD Chowan in the end zone for a 20-yard touchdown with just eight seconds left in the half. The extra point was good, making the score 21-6 Eagles at the half. The Lakers got the ball to start the second half but three plays into the drive, Raddatz’s throw was behind wide receiver Spencer Marlier and was intercepted and returned deep into Laker territory. Three plays later, EP running back Bren Vigil rumbled into the end zone for a touchdown, extending the lead to 28-6. Prior Lake started to put a drive together on the next possession but, facing a third-and-6 on the EP 39-yard line, but Raddatz’s pass down the middle of the field intended for Ellis was intercepted. Eden Prairie then used a long pass and long run to get down to the Laker 2-yard line. Running back Jordan Amundson took the ball into the end zone on the next play and the extra point was good, putting the game out of reach at 35-6 halfway through the third quarter. Raddatz connected with Ellis for a 22-yard score in the fourth quarter to get to the 35-12 final score. Statistically, the Lakers were led on offense by Ellis who finished with six catches for 106 yards and a touchdown. Marlier also had nine catches for 91 yards. Raddatz finished 20 for 34 for 229 yards with two touchdowns and three interceptions. Shaver was the leading rusher with 12 carries for 43 yards. Defensively, linebacker Noah Benson led the Lakers with 13 tackles, linebacker Michael Herbst was second with seven tackles. The Lakers will face a very familiar foe in Week 4 as they travel to Minnetonka to take on the Skippers. The Skippers enter the matchup ranked fifth in the September 19 Star Tribune Class 6A Rankings while the Lakers come in ranked seventh in the same poll. Minnetonka defeated the Lakers twice in 2017, in the regular season at Dan Patch Stadium 27-8 and in heartbreaking fashion in the state quarterfinals at Osseo High School 10-6. This year’s Minnetonka team enters the matchup with the Lakers coming off a 35-16 loss to Maple Grove in Week 3, a team Prior Lake beat earlier in the year. Prior to their defeat against the Crimson, beat Wayzata in a shootout 27-24 in Week 2 and trounced Eagan 42-0 in Week 1. The Skippers are led offensively by quarterback Aaron Syverson. Syverson who is hailed as one of the top quarterbacks in the metro, has completed 43 of 68 passes this season with five touchdowns and two interceptions. Syverson’s top target this season has been Jackson Owens who has 20 receptions for 262 yards and three touchdowns. The Skippers have also shown a run game in the first few weeks, led by running back Tamar Hopkins who has 34 carries for 224 yards and one touchdown. Hopkins missed nearly all of 2017 after suffering a leg injury in Week 1 last season. Kickoff against Minnetonka on Friday is scheduled for 7 p.m. at Minnetonka High School. Be sure to check back next week for a recap of the Minnetonka game and preview of the Week 5 matchup against Burnsville.